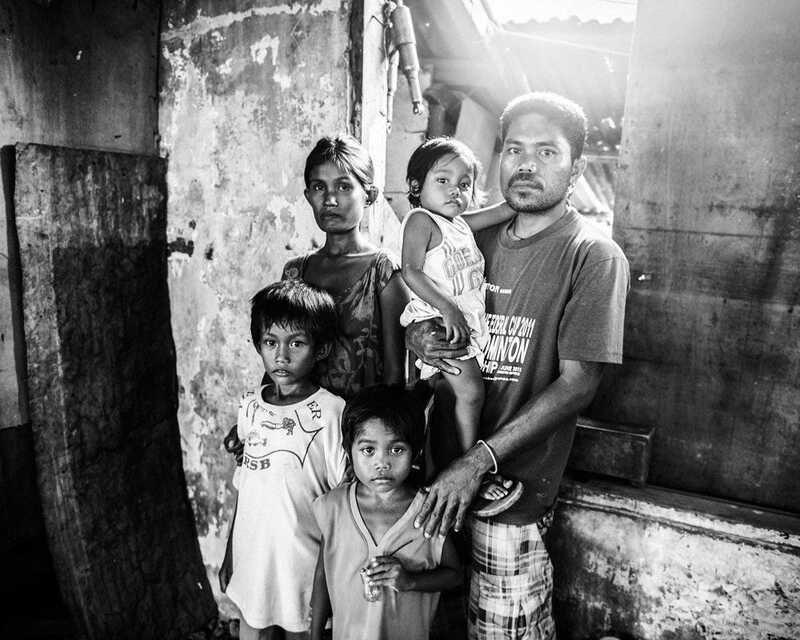 When Typhoon Haiyan hit the Philippines last year, it destroyed more than 1 million homesandcaused $US14 billion of economic damage.This was especially hard for a country wheremore than a quarter of the population lives below the poverty line. 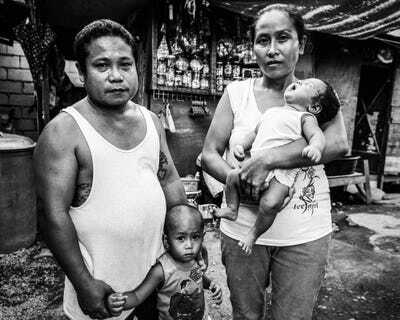 On Leyte Island, where some of the worst damage occured, many families ended up moving into the local jail after their homes were destroyed. 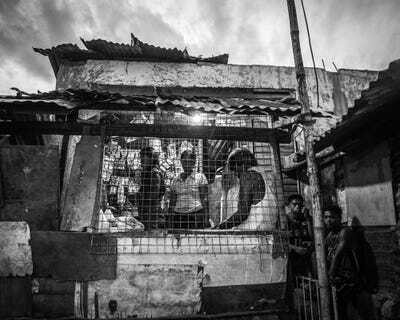 The jail, which had been almost swept away, too, became an unlikely community in the time of desperation. 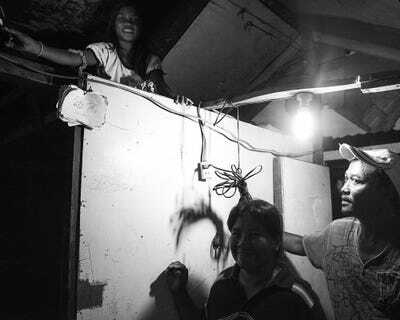 After hearing about the jail from journalist John Jevallana, photographer Lawrence Sumulong visited last year. This is the Leyte Provincial Jail. It houses long-term prisoners and those awaiting trial. It was almost completely destroyed by Typhoon Haiyan. 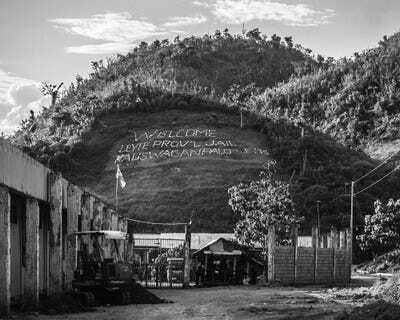 The sign in the hills was built by inmates to welcome visitors. 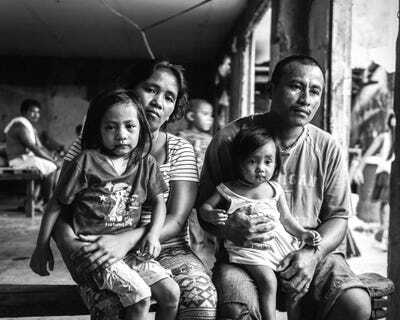 After Typhoon Haiyan hit, prison officials allowed many inmates to leave the prison to check on their families. Many found their families OK but their houses destroyed. 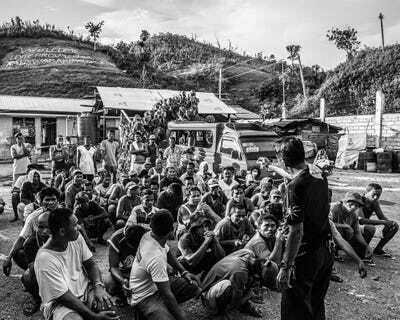 Prisoners were allowed them to move their families with them into the jail. As recently as a few months ago, sixty families were living inside the prison facility. There were two parts to the jail, one that housed 'trusted inmates' and one that housed everyone else. 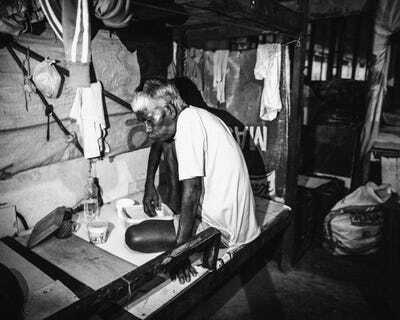 'Trusted inmates' were allowed to live with their relatives in the more relaxed part of the prison complex. 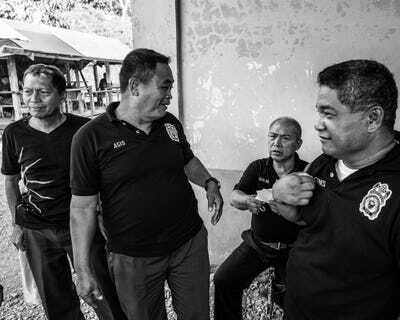 'Trusted inmates' had most often been charged with petty crimes such as robbery and drug trafficking, a prison official told Sumulong. 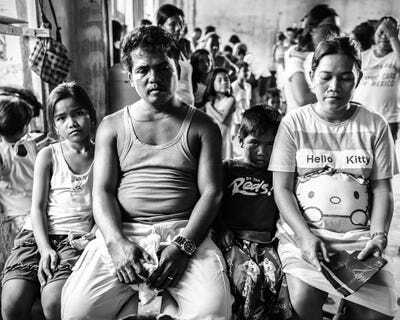 Inmates and their families all lived together in single cells. Walls or dividers between public and private space were nonexistent. The atmosphere among inmates, their families, and the wardens was surprisingly relaxed. A watchtower and an outpost for wardens can be seen in the background behind this couple. This is near the 'comfort room,' an open-air bathroom and shower area. It faces the wilderness and several large hills. The prison has a water purifying system, electricity, rations, a sick ward, and security. Many living there received more amenities than they could hope to have on the outside. 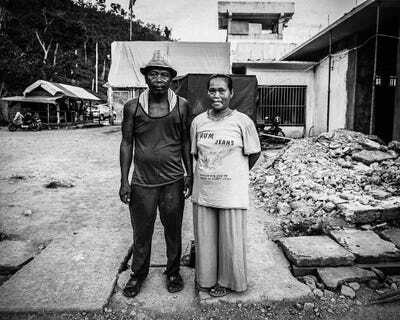 Jean He used to live in a house outside the prison so that she could visit her husband, Roberto Anyou, as often as possible. 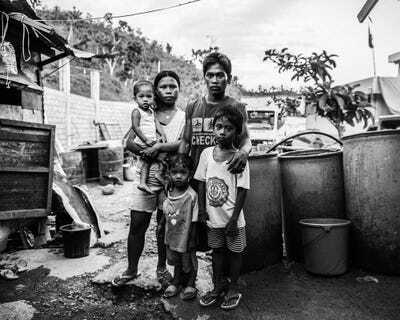 The house was destroyed by Typhoon Haiyan. 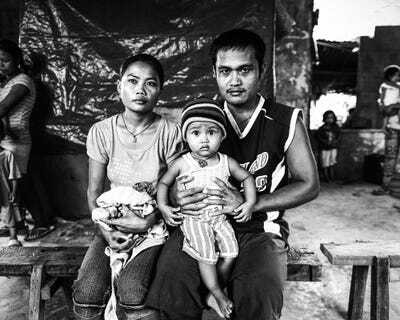 With no other options, she and her child moved into the prison. It was the first time she and her husband had lived together under the same roof. Some of the inmates and their relatives ran small shops in the jail like this vegetable stand. 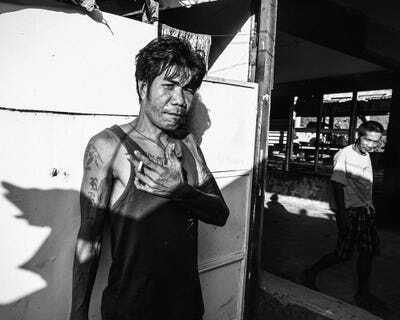 Sumulong likened the area of the prison where the families lived to a small town. 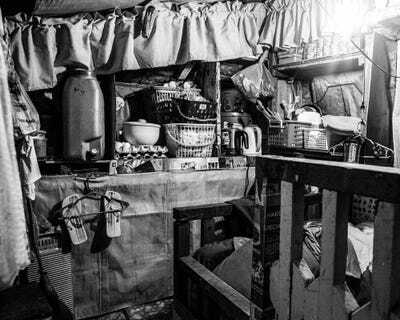 Anyou and He lived in and ran a 'sari sari' or convenience store inside the jail. They built it using materials found in the prison after the typhoon. During the day, they sold cigarettes and chocolate to save for another house. On a good day, they made $9. 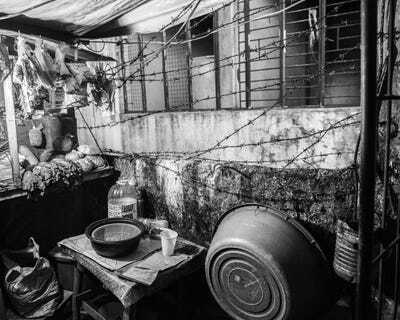 Some of the inmate's 'cells' look pretty similar to homes you might find in Filipino slums. Life at the prison was difficult. In January, 185 inmates broke out. When they were recaptured, they told officers that they left because they were not getting enough food. Families were only allowed to stay temporarily because of the extra strain on the staff. Prisoners are given rations, but their families had to secure their own food. 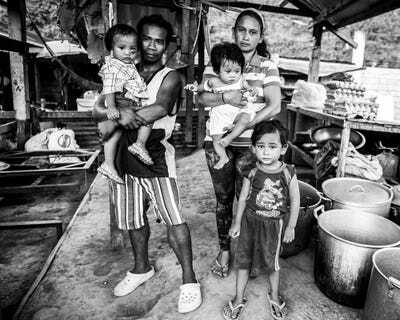 The families planned to only stay for a few months, but, with no money to move out, many stayed for nearly a year before leaving earlier this year. 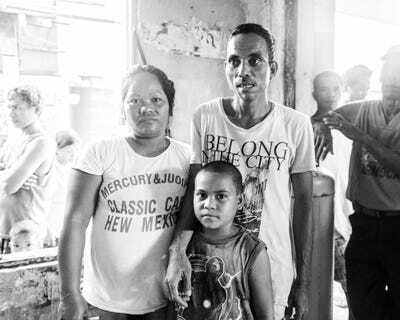 Recently, the families were forced out of the jail so that officers could regain control and normalcy. 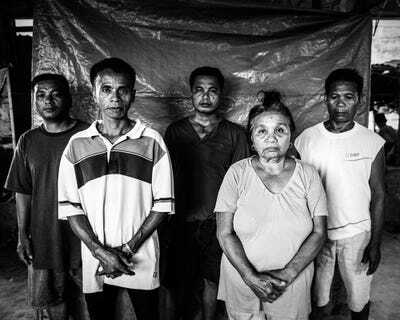 Where they moved to or if they were able to find jobs or a new home is unknown. People do crazy things to survive.